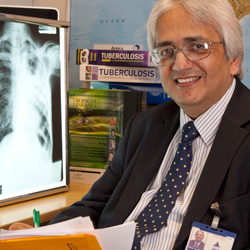 UCL's Professor Alimuddin Zumla is the lead guru of the new Lancet TB Series linked to the Lancet TB Observatory, a new global initiative to address key issues around TB treatment and diagnosis. The launch was held at the World Health Organisation (WHO) in Geneva on 18 May. In this Q&A Professor Alimuddin Zumla (UCL Division of Infection and Immunity) tells us why it is so important that this disease remains on the global health agenda and his commitment to keep it there. What is the Lancet Series? The Lancet Series is highly regarded across the world as a set of 'state of the art' reviews in specialist fields. All conclude with a 'call to action' article which calls upon governments, donors, and funding agencies to support innovations and improvements in a particular field to achieve better global health services and treatments. The Lancet has published several such series, including one on child maltreatment and another on maternal (both launched by scientists from the UCL Institute of Child Health), and decided in October 2008 to cover Tuberculosis. Why is it so important to generate advocacy for TB now? TB is one of the top three killer infectious diseases worldwide with HIV/AIDS and malaria and kills 1.8 million people every year, despite the fact that cheap and effective treatment has been available for over 60 years. The disease kills 5,000 people (both adults and children) every day - three people every minute. This is a shameful indictment of the current world order and is a sad reflection of its neglect by western governments and donor agencies, and of governments of TB endemic countries. Worryingly, drug-resistant TB is spreading and the cost of treating these cases is several times more than drug-sensitive TB. Drug-resistant TB is now rampant in eastern Europe and threatens the rest of Europe. Extensively drug-resistant TB (TB that is resistant to many TB drugs) is now spreading throughout the world. It is therefore important that TB is now brought under control. Furthermore the number of cases of TB is increasing in sub-Saharan Africa because of its close links with the HIV/AIDS epidemic. So African governments need to increase their commitment and improve their health systems with linked TB and HIV/AIDS care for effective delivery of point-of-care health services to manage and control TB. The TB epidemic represents a global health crisis, which is intimately linked to existing economic and development disparities. Urgent action is needed by national governments to fund their programmes, and for the G8 countries and other donor governments, Global Fund, USAID, PEPFAR, EU, World Bank, foundations, academics, civil society, non-governmental and faith-based organisations, public-private partnerships, and WHO to support governmental efforts and contribute to the best of their capacity. There has never been a greater need for health and political world leaders to join in a concerted effort to find sustainable solutions and pursue bold new policies that will facilitate ultimate TB eradication. Can you explain your role in the Lancet TB series? I was selected to take the role of 'lead guru' and was asked to develop an outline proposal for the Series. My proposal comprised six articles covering the epidemiological, clinical and research priorities on important areas of the disease. I selected two TB specialists to act as co-gurus for the Series. Dr Mario Raviglione, Director of the STOP TB Partnership, WHO, Geneva; and Professor Ben Marais, a Paediatric TB expert from Stellenbosch University, South Africa helped me lead the series and acted as co-gurus. What issues and potential solutions do the articles within the Series address? One of the articles reflects upon some of the successes of the current TB control programme and the problems associated with controlling TB in AIDS/HIV endemic areas; drug-resistant TB and extensively drug-resistant TB. Current treatment for TB requires the patient to take six months of anti-TB drugs and many patients stop taking them. Newer drug regimens are being developed to reduce the duration of treatment so that patients can be more compliant. Newer drugs are also being developed for use in drug-resistant TB. Active cases of TB that keep on spreading the disease need to be diagnosed. Unfortunately for the past 100 years, accurate diagnosis of patients with TB is performed by sputum microscopy, a technique that only picks up 50% of cases. The other 50% of cases remain undiagnosed and continue to spread the disease in the community. One of the Series' articles on TB diagnostics and biomarkers updates the readership on the efforts that are trying to develop more sensitive tests for diagnosing TB in adults and children. The current BCG vaccine is not effective in preventing TB in the majority of people immunised. New vaccines that will offer protection in various geographical areas are urgently required and several are under development. Health systems which deliver TB care need to improve so that delivery of care reaches all people in remote areas. In the final paper we call for a serious and sustained worldwide effort to bring tuberculosis under control and start targeting elimination. Strong political commitment at both the international and national level is essential. The call to action speaks to a wide audience, since synergistic action is required on multiple fronts, both inside and outside the traditional confines of TB control. How will the series generate advocacy for TB in practical terms? Firstly it will update all scientists, TB health workers, doctors, scientists, politicians and funders that TB remains a global threat and that, unless action is taken, it will continue to kill millions of people each year. Secondly, by being launched at the World Health Assembly of Ministers of Health in Geneva, the Series will create high-profile visibility for the disease and it will remain on the political agenda for action. Thirdly, it will pressurise donor agencies to keep TB on their funding agenda and invest more in the disease. What is the role of the Lancet TB Observatory? There is a real need to monitor this call to action and make sure that the pronouncements, requests and pledges made in this series will be driving urgent policy changes. To foster this global need, The Lancet in collaboration with the STOP TB Partnership, WHO, the Global Fund and the lead 'gurus and co-gurus' of the Lancet TB Theme series is starting a new initiative, 'The Lancet TB Observatory', which will assess and monitor progress in TB control and research, evaluate domestic and global financing, regularly disseminate information, and advocate for intensified efforts with stakeholders at all levels.